This chilled drink is a delectable thirst quencher on hot summer days. And Its a sweet treat with added health benefits. The subtly crunchy sweet taste of this fruit are at the best during the season. Helpful to quench the inflammation due to asthma, diabetes,arthritis etc. It is high in energy and considered an ideal diet food. Scoop the watermelon pieces in blender with a pinch of pepper. Whip for few seconds and transfer to glass. No need of filtering the juice as it tastes delicious without filtering. Honey 1 tsp can be added if necessary. Garnish with small pieces of waterrmelon. Serve the chilled & refreshing watermelon juice in tall glass. Enjoy this all natural healthy drink with your entire family…! just pass it on jay- perfect for this sweltering heat ! Wat a wonderful juice to beat the heat..very refreshing. 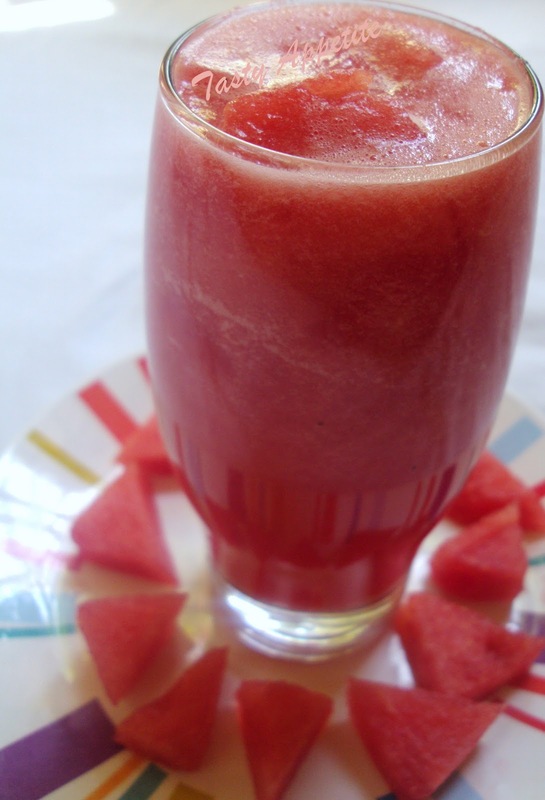 Big relaxation juice for hot climate..
yummy and healthy juice...luks delicious. Thanks friends for your super quick lovely feedback..
healthy n perfect for summer....nice colour juice! What a wonderful cooling treat for this humid weather..
Looks so refreshing! I'm excited to make this during the hotter summer months! Just looking at this makes me feel refreshed!! Ahh- love this- so refreshing n colorful! That makes me thirsty and hungry.So colourful and tempting Jay..
Feel very thirsty right now Jay. Very delicious and colorful recipe dear. Loved it. Wow..that looks super super tempting..
Looks fab...I love the taste of watermelon - so refreshing. Cool, refreshing and brilliant color!! Looks and sounds very cool. Nice recipe... YUM! Ooooooo! look at the color! so beautiful...most welcoming summer drink! Nice and refreshing way to beat the heat. Now this is a wonderful idea for the hot summers in NY and I don't know how come I never thought of it before! It's simply genius, thank you very much, Jay! So refreshing and delicious drink !! Very Very Nice blog.. I am loving it. Great drink for the hot weather, love the colour! Truly drool worthy..yummy yum..looks so tempting n refreshing.. I feel refreshed merely looking at it..thanks for posting. With summer just round the corner this drink is just perfect. Great refresher to quinch this summer. Really ur blog appetise me ravishly. Happy to follow you. perfect for our hot and tropical weather here! yummy drink!!! Ideal for hot summer.. This looks super cool Jay!! Hey Jay..this drink is absolutely refreshing and guilt free...lovely colour. Looks very refreshing...Some awards are waiting for you in my blog.. Refreshing juice! 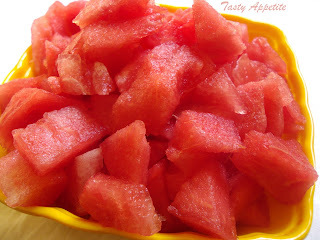 Water melon is great for this time of the year and I loved your twist with the addition of pepper. I LOVE WATERMELON! It's my favourite fruit, and it makes an amazing drink :D So summery too, love it! Thanks for sparing your precious time n popping over my site.. Very cool juice! Gives a nice colour too! So refreshing!!! There is an award for you in my blog. Please accept it. Healthy & refreshing juice. The colour of watermelon so red .... must be very very sweet! wow...what a refreshing juice !such a lovely color ! Nice refreshing drink. Perfect for summer. 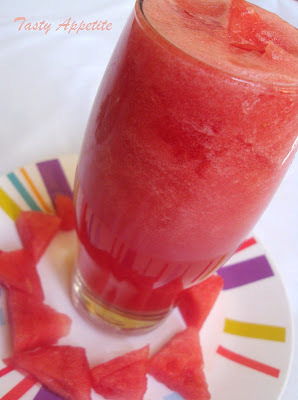 Un jugo rico y lindo de beber y de mirar ,lleno de vitaminas y refrescante una maravilla de receta,cariños,me quedo en tu buen blog,abrazos. Refreshing and healthy watermelon juice. Lovely juice with eye catchy pictures jay . 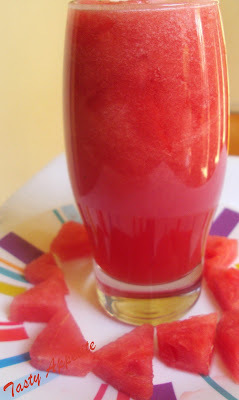 Loved your version of making watermelon juice. Nice pics. If life gives you just melons, make juice! Watermelon is my favorite because it act like viagra . Thanks for sharing this recipe..